Here are a few ways that Noah, and the story of the Ark typifies Jesus, and His work on the cross. His name meant rest. While the world approached judgment, Noah rested in the Word of God. While the world drowned in their sin and rebellion, Noah and his family rested in the safety of the Ark. Jesus is eternal rest for those who believe. Not for body only, but for the inner man. Those who reject Christ as Savior will remain on the outside in turmoil and heartache, but those who come to abide in Christ will rest for eternity with Him. Noah’s Ark was the only way of escape from that judgment. There was no other vessel for salvation. Jesus is the sinners only way of escape from both their enmity with God and eternal judgment still to come. He is the great Ark of God to which sinners can come and by faith enter in, escaping self, sin, and guilt. Christ too acted alone as the ONLY way of passage and escape from judgment. Jesus said “no man takes my life from me, but I lay it down of my own accord.” He was alone in that He came to his own and they did not receive Him. 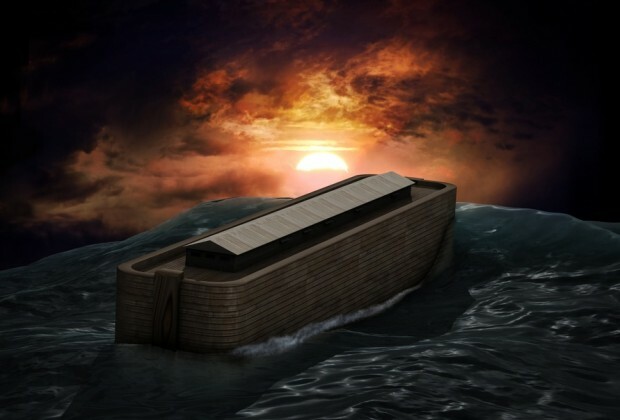 Noah foreshadowed Christ in the great task he was given – to build an Ark and bring with him those whom God would save. The crisis in mans heart is sin. Sin would bring the whole world to ruin if Christ had not come. He was commissioned by the Father to save for Himself a people and make a covenant with them in His blood. Christ took upon Himself the task of saving sinners from death and darkness. Saving you and me from eternal torment in Hell. (John 17:4 ESV)I glorified you on earth, having accomplished the work that you gave me to do. The beauty of the Bible as that Jesus shines forth in all of it. When we seek Him through faith we shall find Him. He truly is the glory of all the ages and eternity.